Synopsis: When a young clownfish is abducted by deep sea divers, his timid father must brave the terrifying ocean in order to rescue his son. Review: The big blue ocean, something that covers around 70 per cent of the surface of this planet. It’s something that is so deep and terrifying, yet there is certainly for some, a deep fascination with the big blue beyond, and the life within it. It would certainly seem that a few folks over at the animation juggernauts of Pixar have this fascination. Fish are not exactly many people’s first choice to have as pets, and therefore to make a full length feature about them, might have seemed like a mad idea for Pixar. Yet as they often do, they pulled it off in spectacular fashion. Right at the very start, everything appears all happy and joyous, and then instantaneously it changes. Disney movies of the past certainly weren’t afraid to go dark where necessary, and the opening scene here is certainly not on a Bambi level of terrifying, it is rather melancholic. But it sets the tone for the movie and really builds the character of our main protagonist, Marlin and why he’s so overprotective of his son Nemo. As such when Nemo is whisked away by divers, Marlin has little choice to go out of his comfort zone, go after him and brave the terrifying ocean, and the ensuing adventure that Marlin ends up has its mix of delightful humour and some more darkish moments. Though it’s probable not many of us have been there ourselves, certainly not as deep, director Andrew Stanton does a terrific job of immersing the audience in this ocean world. The other wildlife and the plant life are all beautifully recreated along with the animation being absolutely perfect. In addition to this, we have a very interesting collection of characters. Marlin is a clownfish, but he struggles to tell a good joke. However he doesn’t need to as he’s aided on his quest to rescue his son by the lovable but forgetful Dory, voiced by the brilliant Ellen DeGeneres. There’s a fair bit of dramatic moments mixed in with some truly hilarious ones too, such as the shark equivalent of Alcoholics Anonymous. In Nemo’s unfamiliar surroundings, we have the likes of the serious but friendly Gill (Willem Dafoe) Bloat (Brad Garrett) a porcupine pufferfish of whom does his bit to ensure that the laughs keep on coming. The screenplay is so well written that you care about every one of the characters on screen, particularly Marlin, Nemo and certainly Dory too. The latter of whom proved to be such a popular character, that she is getting her own film, due out this summer. It’s easy to see why as a lot of the comedy comes from her forgetfulness and funny one liners. The characters are extremely well developed and the fact that the voices involved are provided by some top Hollywood talent ensures that the there’s that emotional connection between them and the audience. There are plenty of humorous moments littered throughout this really entertaining story. Even some of the side characters provide some of the most ridiculously entertaining moments. The sharks, the turtles and in particular the seagulls especially in particular do their best to keep the laughs coming. The latter of whom although they don’t have the largest amount of screen time, they certainly make a significant impression, and you might just find yourself saying “mine” just a little bit. Whoever knew that a story about the life of aquatic based animals could be so entertaining and so heartfelt? 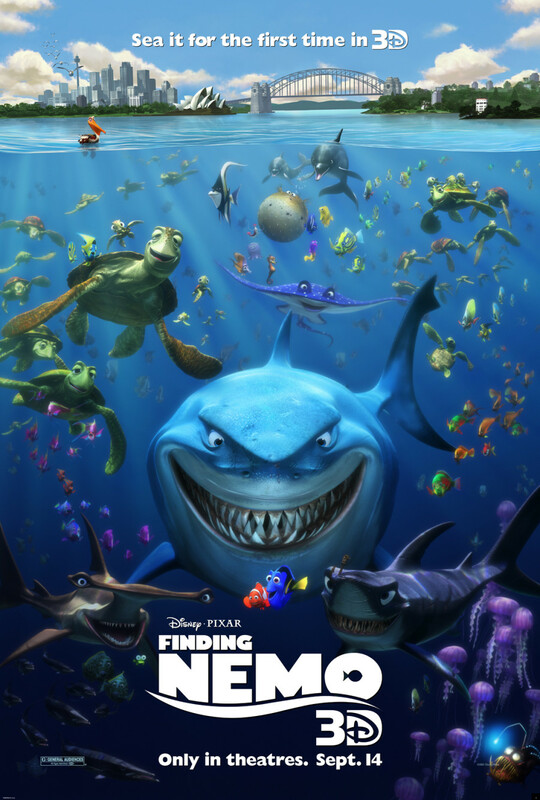 Beautiful animation with some great humour, along with well written, developed and lovable characters, Pixar just kept swimming onto success with this wonderful story. One of their finest without a doubt.